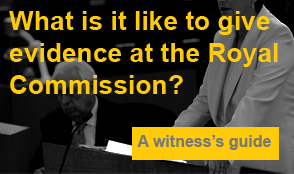 The Royal Commission will conduct its first public hearing into child sexual abuse in Government run institutions next week. The hearing about the Parramatta Girls’ Home and the Hay Institutions commences on Wednesday 26 February. Although the NSW government has apologised to victims, it has never offered lump sum compensation to care leavers. Ladies who were home-girls at either of these institutions should call Peter Kelso on 02 4907 4200 to find out more. Now is the best time to come forward.